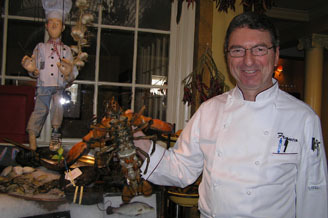 Executive Chef Franco Maltagliati of Polpo Restaurant and Saloon in Greenwich, Connecticut shares a seafood recipe that is perfect for springtime. Polpo Restaurant and Saloon in Greenwich, Connecticut is a dream of an Italian restaurant where Italian-born Executive Chef Franco Maltagliati shares his passion for cooking with the upscale clientele. Owned by Ron Rosa, Polpo Restaurant and Saloon opened in 2000 in a 1908 building where history continues to be made each day in the restaurant and the saloon. Chef Franco, a native of Tuscany, began his culinary career in Italy's Lake District and Milan before coming to New York more than 25 years ago to work with Ron Rosa. He shares his tempting recipe for Pagello in Crosta con Carciofa (Fillet of Wild Red Snapper Oreganato with Artichoke) with Luxury Experience readers. Mangia bene! Preparation: Place the artichoke in a pot, cover with water, and boil until the artichoke is tender. Remove from the heat and drain. Quarter the artichoke, and roast the quarters with a little olive oil in the oven for a few minutes. Mix the breadcrumbs with oregano, salt, pepper and minced garlic, and add enough olive oil to make them very moist. Sear the snapper with extra virgin olive oil, white wine and butter and thoroughly cook the fish. After 10 minutes, place the moist breadcrumbs on top of the fish, and place in the oven at 160º C (325º F). Cook until the breadcrumbs are golden brown, and serve the red snapper with the crispy artichokes. 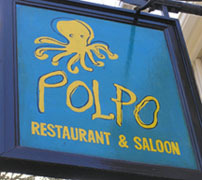 Read our other articles on Polpo Restaurant and Saloon in the Restaurants and Liquor Cabinet sections. © May 2006. Luxury Experience. www.luxuryexperience.com. All rights reserved.